Whether you are looking for a leather case or tube, it’s safer preservation to travel with one in your luggage or clothing. These cases are typically made from wood, carbon, plastic, combination, or best of all, leather. When choosing the best cigar travel case, you should pick one that will help you protect your cigars against damage and drying out while also making a personal statement. What example suits your smoke personality? Can a travel cigar case replace an at home humidor? How many cigars can you store in a cigar travel case? What’s the best way to carry a travel cigar case? How much do cigar travel cases cost? So you’re ready to purchase your travel humidor? There are a ton of good options out there, and what really matters is your budget. Leather cases with wood interiors are our favorites, but you may have a particular style in mind. In our list, we chose tubes and cases made from a variety of materials in different price ranges to help you pick the perfect travel cigar case for your needs. CIGARISM is a well-known brand that delivers high-quality, unique-looking cases that have quality materials. Their travel humidor case is a beautiful piece made from Spanish cedar and leather with the capacity to hold four max length cigars. The kit also comes with a copper cutter, double-torch jet flame lighter, siphon, and tray. Basically, it’s everything you need to enjoy a cigar on the go. 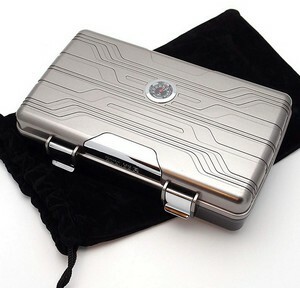 In our opinion, this is one of the best cigar travel cases that you can buy because it has everything you need. 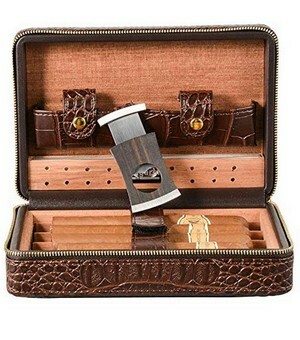 It also keeps your cigars exceedingly fresh inside of a great-looking leather case with top-notch design. This is the ideal case made for people on the go who want a stylish, quality case that only holds their favorite, select cigars. The AMANCY Popular Cedar Wood Leather travel cigar case one of the most highly rated cigar tubes on the market. It uses PU leather on the outside with cedar wood inside, keeping cigars fresh and immaculate. The design is a little light on quality, but it gets the job done. You can’t beat this tube for the price, especially if you are looking for a way to store cigars in your luggage or pocket as you travel. AMANCY is also a top-notch brand that was only established in 2002. So far, the company has made several cases for lower budget cigar aficionados, and each case preserves cigars extremely well with a handmade hygrometer and humidifier. For the price, you can’t beat this cigar travel tube. There is so much to love about the Volenx Crocodile Leather travel case. For one, these are high-quality cases made from 100% leather and feature a fantastic design with grooves and soft touches. The cedar wood lining inside smells intoxicating upon first open, and everything is there for you to set up an amazing travel humidor. 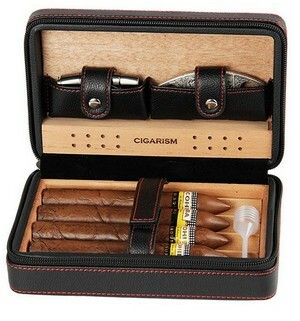 The case has a removable tray that helps you conveniently organize and preserve your cigars. You can store up to four cigars of max length inside of this case. It also comes with a stainless steel cutter that is easy to use. You can also store your cutter and lighter in the button pockets located on the top of the case. It is genuinely one stylish case to bring with you anywhere. For those who want to pull out a cigar case on the fly from their suit pocket, the AMANCY 3-finger brown leather case is a perfect choice. You will absolutely love this wood-lined tube case that comes with a silver stainless steel cutter. It’s incredibly fashionable, easy-to-use, and budget-friendly. 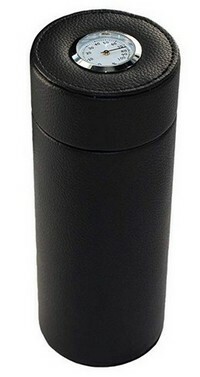 It’s also one of the most highly rated cigar tube cases available. We love the classic brown leather style of this case. It’s incredibly smooth and lightweight, allowing you to slip it into your pocket and keep ready for your after-meeting celebration. It measures just seven by 3.6 by 1.4 inches, and you can easily pull out your choice of cigar and store your cutter in the front pocket. When you are headed to a big event or even if you want to store all of your favorite cigars at home, the Jamestown Cigar Plastic Travel Humidor Case is a great buy. This top-rated travel case is waterproof, dustproof, and shockproof due to the hard outer shell. While it’s not the most stylish thing to look at, you can definitely keep all of your cigars fresh in this sealed case. It’s easy to store and open the case. It comes with a built-in humidor that allows you to preserve cigars in the best conditions for more extended periods of time. If you need to bring it with you, it looks just like a security case and uses custom-moldable foam to keep cigars in place as you move. 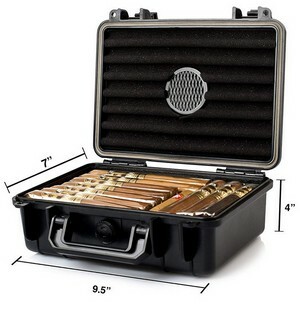 You can hold up to 30 maximum length cigars with this case. The unique craftsmanship is easy to behold with the LAGUTE Groucho Cigar Case. 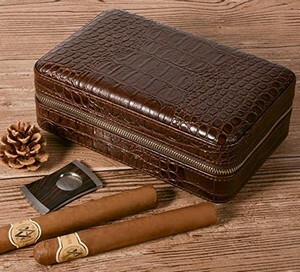 Made from genuine crocodile leather, you can’t beat the beautiful look of the dark brown leather on this travel humidor. You can protect your cigars from all kinds of problems, but it has a high humidity absorption rate, allowing you to age cigars safely while enhancing the flavor of your cigars from the cedar wood lining. This case comes with a humidifier inside and dropper, making it easy to fix the humidity of your case. You will never have to deal with too dry or moist conditions, which can deteriorate from the overall quality of your cigars. LAGUTE also allows you to hold up to 6 cigars with this case, making it one of the smallest yet largest capacity cases on the market. The zipper lock also improves the strength of the seal, making it impossible to disturb your humid levels inside. It also comes with a black carton box and fabric bag, which works perfectly as a gift for someone in your life who loves cigars. For those who want to store more than a few cigars and need a durable travel case, Mrs. Brog has the perfect travel cigar case. It includes a built-in hygrometer and humidifier with an airtight silicone seal. The latches make it easy to open and close, while also providing a perfect closure to keep your cigars fresh. This case holds up to 10 full-sized cigars easily. While small enough that you can bring it with you, there’s no handle. You can use the accessory bag to carry it, but we find it’s more likely that you’ll store this in your luggage or use it as home to store your cigars. Now that you have read through a few of our top choices. What are you looking for in your perfect travel cigar case? We like to think that the best cases have a bit of style while also providing a genuine seal and humidifier inside to keep cigars extremely fresh. However, not every travel humidor is created equally, and there are some brands out there that may trick you into thinking that it won’t dry out your cigars without making the humidor with the right materials. These are a few things to keep in mind when shopping for your travel humidor case. Cigars need a warm environment with a bit of humidity to avoid drying out while also aging to enhance the flavor. When you have lots of cigars and want to carry them with you, it’s essential to have a case that can store and preserve them without any drying out or moisture. It can be challenging to find a case that will save your cigars for very long. However, all of the cases listed above are perfect examples of high-quality designs that include humidifiers and hygrometers inside. This is the main benefit for those who want to travel with cigars wherever they go. You’ll need a case that has a humidifier and hygrometer to achieve the perfect preservation and freshness level. Many travel humidors are able to preserve cigars just as long as an at-home humidor if you purchase one made from high-quality materials with a sealed design. A travel cigar case is typically small in design, measuring only a few inches wide in some of the tube cases or ranging up to 12 inches long and wide in other cases. 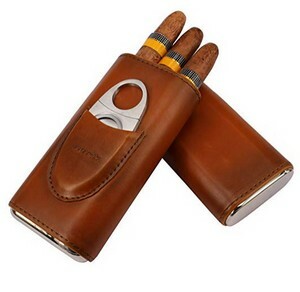 If you only plan to hold 4 to 6 cigars, then you’ll probably have a pocket case that can keep multiple maximum length cigars and allow you to take your cigars with you while protected. There are other benefits for those who buy a larger travel humidor, such as one that can hold up to 30 cigars. With these cases, you can keep your collection at home and use a smaller travel case, such as a humidor tube to bring your cigars with you. Cases come in all kinds of designs, and they are made with different materials. While we are particularly gaga for leather cases, you can find excellent quality carbon, plastic, and wood cases that are also beautiful or at least highly durable. When you purchase a cigar case, you should always think about the environment where you’ll be needing one. If you are always traveling and going to meetings where you’ll likely show off a case, then buying a design with genuine leather is vital. Many travel cases come with everything you need to get started with a cigar hobby. You can store multiple cigars, while also having a pocket for your steel cutter and lighter. It’s clear that these cases sell a lot more because they have everything organized in one case. If you can’t afford a real humidor at home, then a travel humidor can be the perfect resolution. You can typically purchase small and large humidors for under $50, with smaller tubes and cases that hold four cigars usually costing much less, depending on the materials used in the craftsmanship. When you start to smoke cigars, you will notice that a lot of aficionados have travel tubes that they slip into their pocket. These are the best cases for those who want to travel with a classy case in their pocket. You can quickly move it into your pocket when you’re headed out and then show it off when you want to smoke one with colleagues or potential clients. 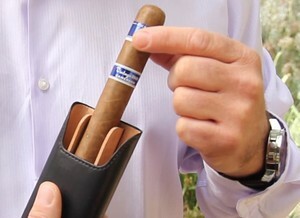 Cigar travel cases can also be used at home to store multiple cigars. There are larger cases with handles and lightweight designs that can be carried, or you can save at home. Typically, these cases hold more than ten maximum length cigar with bigger travel cases holding up to 30 or more cigars at a time. Cigar travel cases also make a great gift. If you know someone who smokes cigars but doesn’t have their own leather travel case, you can instantly make a friend by finding a high-quality case online for a great price. You don’t have to spend very much to provide an incredible travel humidor to your giftee. There are certain features that we look for in a top-quality travel cigar case. For one, you want something that is going to hold the number of cigars you like to travel with. If you know that you like to travel with more than four cigars at a time, then you’ll need to pick a case that can accommodate your style. When you see a case lined with cedar, then you know you are looking at a quality case. Almost all of the high-quality cases use cedar to line the inside of their travel cases. Spanish cedar is the most sought after type because of its ability to regulate moisture naturally. It also enhances the flavor of cigars, according to aficionados. However, there are others who say that keeping your cigars stored in cedar for too long can change the flavor to bitterness. You also want to find a case that has a hygrometer and humidifier inside of the interior design. We go into depth about that below. Genuine leather is our preferred choice for the exterior of your case. The material for the outside of your case is just as important as the interior. You want to find a case that uses high-quality, durable materials that won’t let in moisture. The exterior also must be able to keep heat inside the case. If you are looking for a more durable case in terms of waterproof and scratch resistance, then you may want to go with plastic, carbon, or sealed wood case. Inside of your case, you may have enough room for a humidifier and hygrometer. However, some cases will place the hygrometer on the outside of the case. You don’t want to buy a case that doesn’t have these two pieces because they keep the balance of humidity and moisture, allowing your cigars to stay preserved and never suffer from drying out. Companies will include a warranty or guarantee to ensure that your cigars are protected. Not all of the cases come with warranties, but you will find that certain brands offer a one-year limited warranty in case of a factory defect. In more instances, you’ll find that brands offer a money-back guarantee if something happens to your cigars within the first 90 days. If you want a case that comes with everything, including the humidifier, steel cutter, siphon, and tray, then you’ll probably find it with a case “set” or “cigar case gift set.” These include several accessories, but the best value we’ve seen is with the CIGARISM travel case. When picking out a case specifically for travel, you have to decide how many cigars you want to bring with you first. If you always have the same 3 to 4 cigars, and you don’t need any more than that, then a smaller tube case could be the perfect solution. These slip in your suit pocket easily and open up at the center, allowing you to choose which cigar you want to smoke easily. There are also cases that are larger and have a handle for easy carrying, but you probably won’t need these if you are headed through an airport. In this case, you want something smaller that can fit in your carry-on and doesn’t include a cutter, which you would need to store in a checked bag. Ultimately, a lightweight case with the perfect seal and humidifier inside will go further than a fancy leather case with no seal and very little room for a humidifier. 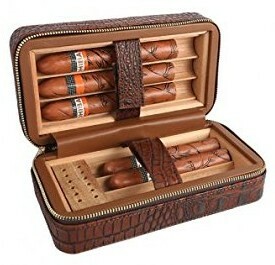 You can use a travel case to replace a humidor at home if you purchase a larger case that can hold more than ten cigars. If you aren’t collecting that many cigars, then you may only want to buy single cigars to go in your smaller traveling case. The smaller cases and tubes can hold 2 to 6 maximum length cigars. A tube case will likely only hold less than four cigars. There are larger cases that hold between 10 and 40 cigars as well. If you plan to travel with 50 or more cigars, then you’ll likely need a heavy duty humidor case with a hard outer shell or a wooden travel case. For those who have a small cigar tube, you can slip this into your suit pocket with no issues. When you purchase a larger case that has a humidifier inside and a zip seal, then you may be able to store in your carry-on if it doesn’t include a steel cutter. You won’t be able to bring a cutter or lighter on board a plane, for example with larger cases, you. May get questions about carrying so many cigars on a plane. It may be more suitable to carry more than six cigars in a checked bag rather than a carry-on or on your person. The costs range up from $15 to $500 in some cases. This really depends on the materials, design, and hand craftsmanship. Smaller, high-quality cases typically only cost around $20 to $50, but you can find gift sets that go up from $50 to $100. Genuine leather, high-quality wood cases, and cases made with unique designs can cost upwards of $150 to over $1,000 depending on their size. It all depends on what you’re looking for and the number of cigars you want to travel with. Out of all the cigar travel cases we reviewed, we truly like the CIGARISM set the most because of the design and quality. However, if you want something smaller and budget-friendly, we recommend going with the AMANCY three-finger due to its brown leather beauty and easy to conceal design.